In Shikoku, you learn that coming in first isn’t always the best. Designed by Eloi Pujadas, Shikoku is a card-drafting, action-programming racing game being localized to the United States by the Grand Gamers Guild. 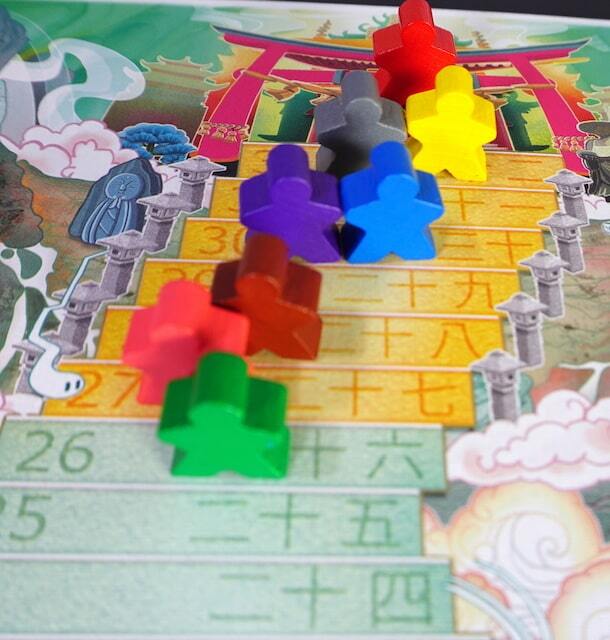 You and your fellow players are pilgrims climbing the steps to a Buddhist temple on the Japanese island of Shikoku. With rules that are easy to learn, but hard to explain, we go a little longer on this SNAP review. Listen to the whole thing in 8 minutes, or read on below. Each turn, play a card from your hand to climb the steps. Turn order is determined by the previous round’s movement. The goal of Shikoku is to take the middle path: be second or second-to-last in the line when someone reaches the 33rd step. After each player has laid their card for the round, all cards are put in order from lowest number to highest. The players who laid the second and second-to-last cards in numerical order will NOT move this round. All other players move their pawns up a certain number of steps, pictured by sandals on the card they played. After movement, players each draft a card from the previous round to bring their hand up to 3. The first player in order receives the top card from the deck instead, so one card from the round will not be drafted. At first, we weren’t sure how we felt about Shikoku. Our very first play included 2 of our children, and we wondered if they might have issues with it – but it turned out to be very easy to learn and play. It felt very Japanese. It reminds me of Tokaido, but not because of the art. There’s a jerky stop-start or push-pull feel that we quickly grew to appreciate. You’re always trying to be near the front or near the back without being first or last, and you’ve always got some control over your movement. We think it has just the right amount of player interaction – you can occasionally block a player from doing what they want, but only if you get the right card & the right timing. Watch out for negative reactions when a player really wanted to move and gets blocked instead. You’re never going to be overwhelmed with choices. You only have 3 cards in your hand, and at most 8 cards to choose from in the drafting phase (usually fewer). The board feels a little cramped, especially at higher player counts. The numbering on the cards is thematic, but not as legible as it should be. 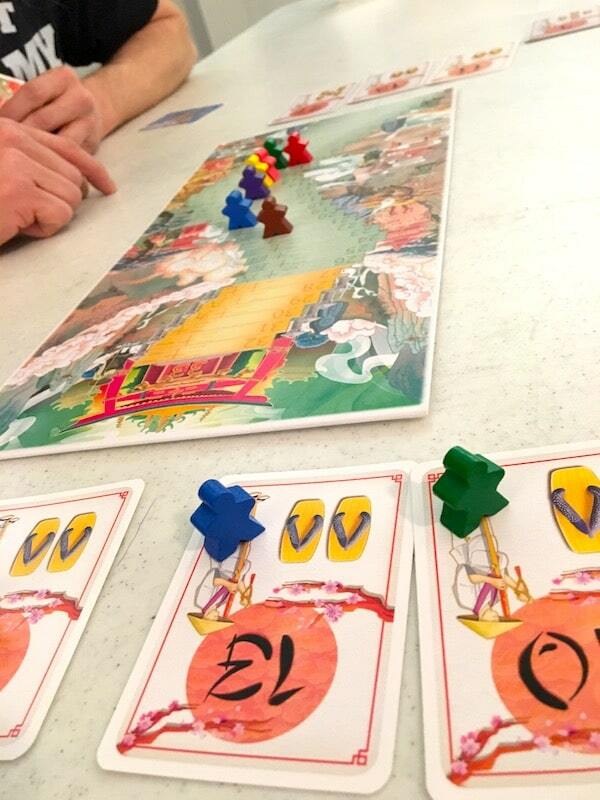 Overall, we feel Shikoku is an excellent gateway game for both children and adults. We give it 3 and half sandals. Pre-order for $25 from Grand Gamers Guild for June delivery.